Sergei Aleksandrovich Yesenin, sometimes spelled Esenin (Russian: Серге́й Алекса́ндрович Есе́нин; October 3, 1895 – December 28, 1925) was a famous Russian lyrical poet of the Silver Age of Russian poetry. He was briefly married to the famous American dancer, Isadora Duncan. He would later commit suicide. It would be easy to attribute his death, like Mayakovsky's, to the disillusionment that he must have felt when the revolution that he supported failed to live up to his expectation, but the truth is more complex. His drinking and dysfunctional lifestyle ultimately played a significant role in his death. Yesenin seemed plagued by his own inner demons. Yesenin's roots were in the Russian countryside. His poetry showed the influence of the Russian folk traditions as well as a love of the beauty of the landscape which seemed to strike deeply into the famous Russian soul. Born in the village of Konstantinovo (today Yesenino), in the Ryazan region of Russia into a peasant family, Sergei Yesenin was sent early on to live with his grandparents. He began to write poetry at the age of nine. A literary prodigy, in 1912, he moved to Moscow where he supported himself by working as a proofreader in a printing company. The following year, he enrolled in Moscow State University as an external student, studying there for a year and a half. His early poetry was inspired by Russian folklore. He belonged to a group that Ivan Surikov, a nineteenth century Russian peasant and poet. In 1915, he moved to St Petersburg, where he became acquainted with fellow-poets Alexander Blok, Sergei Gorodetsky, Nikolai Klyuev, and Andrey Bely. It was in St Petersburg that he became well-known in literature circles. Alexander Blok was especially helpful in promoting Yesenin's early career as a poet. 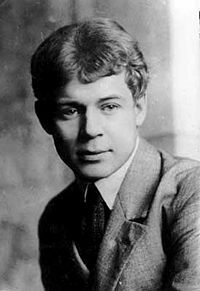 Yesenin said that Bely gave him the meaning of form while Blok and Klyuev taught him lyricism. In 1915, Sergei Yesenin published his first book of poems, titled Radunitsa, soon followed by Ritual for the Dead (1916). Through his collections of poignant poetry about love and the simple life, he became one of the most popular poets of the day. He became particularly close to Klyuev, leading some to speculate about a homosexual relationship. "For the next two years, they were a team…living together most of the time…. Collections of his poetry, usually include his three love letters to Klyuev, without specifying to whom they were written." In 1916-1917, Sergei Yesenin was drafted into military duty, but soon after the Russian Revolution of 1917, Russia exited World War I. Believing that the revolution would bring a better life, he briefly supported it, but soon became disillusioned, and sometimes even criticized the Bolshevik rule in such poems as "The Stern October Has Deceived Me." In August 1917, Yesenin married for a second time to the actress, Zinaida Raikh (later wife of Russian theatrical producer, Vsevolod Meyerhold). With her he had a daughter, Tatyana, and a son, Konstantin. Konstantin later became a well-known Football (soccer) statistician. In the fall of 1921, while visiting the studio of painter Alexei Yakovlev, he met the Paris-based American dancer Isadora Duncan, a woman 17 years his senior who knew only a dozen words in Russian, while he spoke no foreign languages. They married on May 2, 1922. Yesenin accompanied his new celebrity wife on a tour of Europe and the United States but at this point in his life, an addiction to alcohol had gotten out of control. Often drunk or on drugs, his violent rages resulted in Yesenin destroying hotel rooms or causing disturbances in restaurants. This behavior received a great deal of publicity in the world's press. The marriage to Duncan lasted only a short time, and in May of 1923, he returned to Moscow. There, he immediately became involved with actress Augusta Miklashevskaya and is believed to have married her in a civil ceremony, although it's known he never obtained a divorce from Isadora Duncan. Another lover of his during this time, Galina Benislavskaya, committed suicide at his grave a year after his death. Yesenin's behavior grew increasingly reckless and that same year he had a son, Alexander, by the poet, Nadezhda Volpin. Sergei Yesenin never knew his son by Volpin, but Alexander Esenin-Volpin grew up to become a prominent poet and activist in the Soviet Union's dissident movement of the 1960s with Andrei Sakharov and others. After moving to the United States, Esenin-Volpin became a prominent mathematician. The last two years of Sergei Yesenin's life were filled with constant erratic and drunken behavior, but he also created some of his most famous pieces of poetry. In the spring of 1925, a highly volatile Sergei Yesenin met and married his fifth wife, Sophia Andreyevna Tolstaya, a granddaughter of famous nineteenth century Russian novelist, Count Leo Tolstoy. She attempted to get him help, but he suffered a complete mental breakdown and was hospitalized for a month. … With the greatest difficulty I recognized Yesenin. With difficulty, too, I rejected his persistent demands that we go for a drink, demands accompanied by the waving of a fat bunch of banknotes. All day long I had his depressing image before me, and in the evening, of course, I discussed with my colleagues what could be done about Yesenin. Unfortunately, in such a situation everyone always limits oneself to talk. Two days after his release for Christmas, he allegedly cut his wrist and wrote a farewell poem in his own blood; the following day hanged himself from the heating pipes on the ceiling of his room in the Hotel Anglettere, dying at the age of 30. Some believe that the suicide was staged, and in actuality he was killed by GPU agents, although there is no actual proof for this theory. Yesenin was always surrounded by satellites. The saddest thing of all was to see, next to Yesenin, a random group of men who had nothing to do with literature, but simply liked (as they still do) to drink somebody else's vodka, bask in someone else's fame, and hide behind someone else's authority. It was not through this black swarm, however, that he perished, he drew them to himself. He knew what they were worth; but in his state he found it easier to be with people he despised. 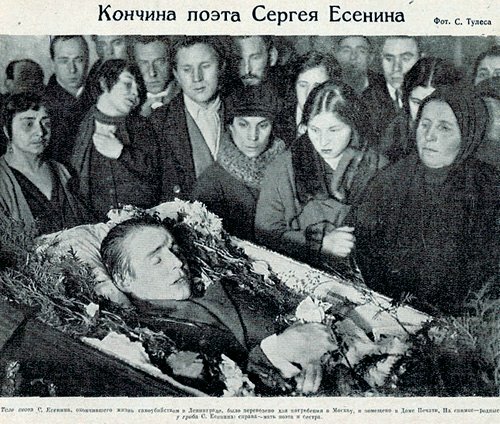 Although he was one of Russia's most popular poets and had been given an elaborate funeral by the State, most of his writings were banned by the Kremlin during the reign of Joseph Stalin and Nikita Khrushchev. Nikolay Bukharin's criticism of Yesenin contributed significantly to the banning. Only in 1966 were most of his works republished. Today, Sergei Yesenin's poems are still being memorized by school children and many have been set to music, recorded as popular songs. The early death, unsympathetic views by some of the literary elite, adoration by ordinary people, sensational behavior, all contributed to the enduring and near mythical popular image of the Russian poet. Sergei Yesenin is interred in Moscow's Vagankovskoye Cemetery. His grave is marked by a white marble sculpture. Yesenin's life and oeuvre are both short. Aside from the celebrity accorded to his suicide poem, Yesenin's most important poetry is to be found in his meditations on the Russian countryside and his own rural background. It seems to have struck a chord with a nation that remained ninety per cent peasant and closely tied to the land. It was sentimental, but also displayed a sophisticated knowledge of the Russian folk traditions and religious heritage. Right after the Revolution, he (naively) wrote several poems which embraced not so much the revolution itself, but the spirit of change which would sweep away the dull stupidities of the past. Yesenin, like many of his contemporaries, placed his own personal hopes upon the revolution, only to reject it later after realizing the direction that it would take. While his poetic range proved to be limited, his best poetry is a fine example of Silver Age poetry. Good bye, my friend, good bye. My dear one, you are inside my chest. But living, of course, isn't novel either. ↑ Winston Leyland, ed, Gay Roots: Twenty Years of Gay Sunshine (San Francisco, 1991). Biography, photos and poetry (Russian). Yesenin's museum in Viazma (Russian). This page was last modified on 30 July 2013, at 17:22.